frame style #1 NOTE: The numbers were all the same color, a bright pink, not the neon pick shown her nor the red in the next photo. At our daughter Rebecca’s home garden wedding, I gave a lot of thought to just how to number the tables. I decided to stitch the embroidery in the wedding colors and frame them. They are large enough to be read easily and yet took up very little table space. First, I went to an outlet store and purchased the gold frames. I was unable to find 15 exactly the same, so I just selected frames with a similar look. When looking for their table, I thought no guest notices or cares that the frames are not all identical. Next it was important to make certain that the number design would fit into the frame. Double digit numbers were a challenge and even in a reduced size, really hugged the edge of the frame. They also required a smaller floral design. The floral designs are from Sue Box. Absolutely everything she digitizes is spectacular. 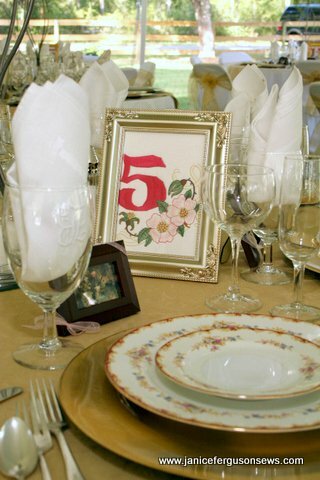 From her fabulous Golden Classics collection, one or another of the Briar Rose subcategory of designs was embroidered on every table number. The ribbon outline was stitched in gold metallic to accent the gold in the color scheme. When the tables were set for the reception, I was very satisfied with the table numbers. 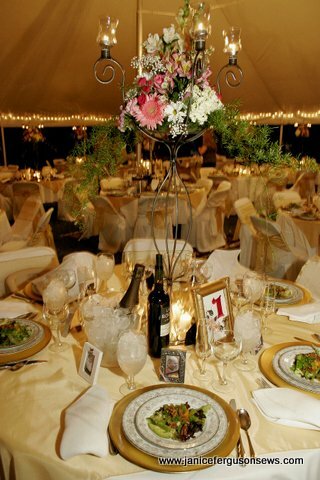 In all the glitz and glow of candlelight, silver or plexiglass ice buckets, gold chargers (except for the bridal table which had silver), and sparkling glasses, the framed numbers gave visual weight to each table setting. It was a visual relief from all the twinkling. Of course, the wine bottles served the same purpose to some extent, but not as effectively for me. My husband doubted the wisdom of spending so much time on a single use item. But Rebecca and Harvey loved them and, in fact, they have been loaned out for several events since then. A childhood friend of Rebecca’s recently shipped them back to me from a wedding in Pennsylvania and Harvey’s mother, Carol, has used them several times. Her church holds a lovely Mother’s Tea in May. 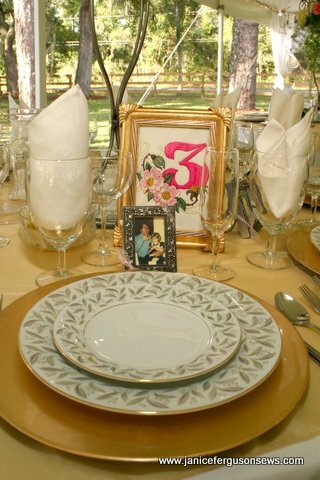 The numbers have marked the tables for that event every year since Rebecca’s wedding. 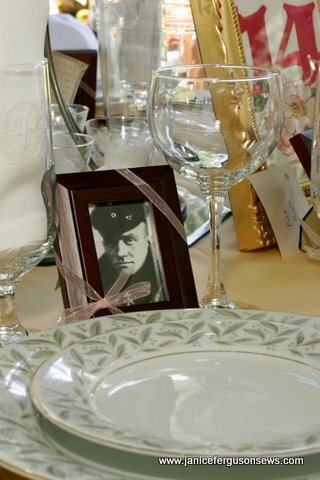 This place card/photo for Rebecca’s godfather shows him holding 2 year old Rebecca. One special touch that required no sewing was the framed picture place cards. These little framed momentos were the guest favors. Again, I was unable to find 125 identical frames, but the frames at each table matched. Harvey’s mother and I spent a lot of time looking through old photos to find shots of our guests with the bride or groom. Table 3 shows 2 year old Rebecca on the knee of her godfather. With guests coming from Washington state to Maine, Lousiana to Pennsylvania and from one side of Florida to the other, we wanted all the know that their influence on the lives of our children was important and appreciated. The guests seemed to enjoy the old images, many of which they had never seen. We had fun with the few guests for whom we had no old pictures. For our family doctor, we used a picture of Dr. Kildare. Remember him? For the always bejeweled, very blonde mother of the matron of honor, a glam shot of Zsa Zsa Gabor marked her place. Another guest for whom we had no photo has a flight school. In his frame was The Red Baron. He had no trouble identifying his seat at the table. 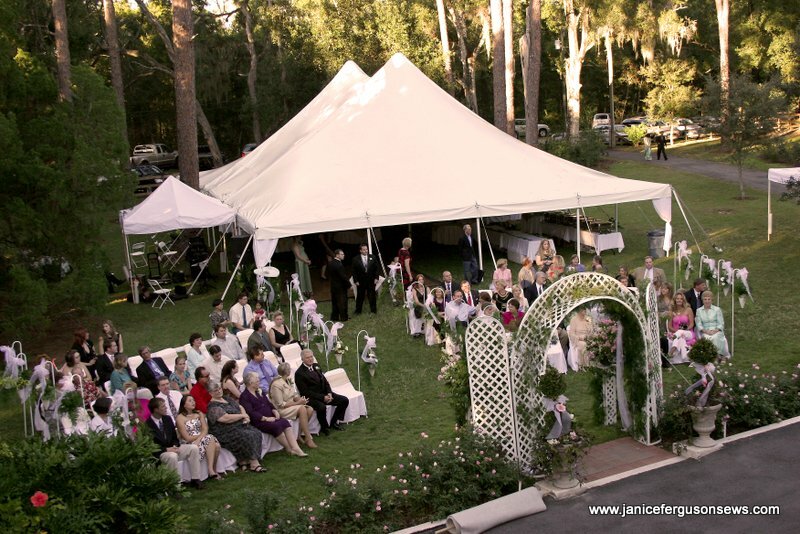 What a fabulous time we had, preparing for the wedding and enjoying it as it so quickly transpired. Now we have little Alastair to celebrate. 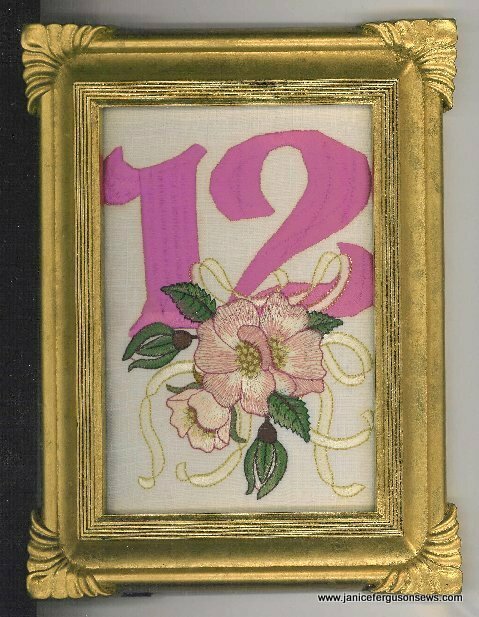 This entry was posted in machine embroidery, party accessories and ideas, wedding and tagged embroidered table numbers, table numbers, wedding placecards, wedding table numbers. Bookmark the permalink. Creative idea sewing a sign to identify the tables and an idea which can be used for many different functions. This was amazing! So many details went into Becca and Harvey’s wedding day. It was truly awe-inspiring!